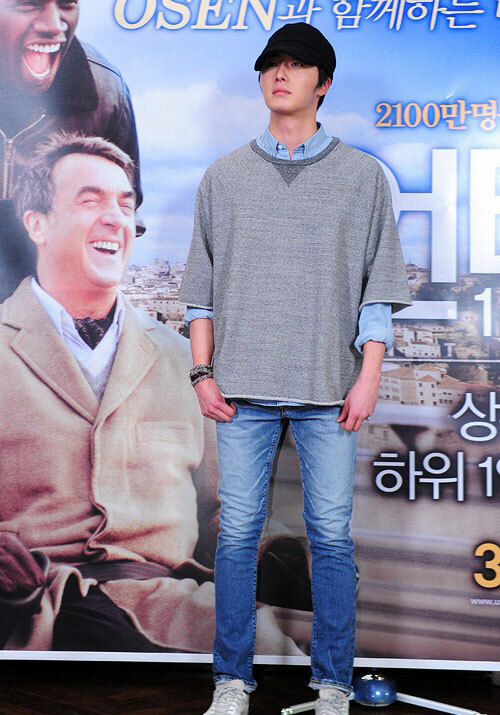 Actor Jung Il Woo was appearing at the film screening with a casual wear, attracting attention. On March 7th, 2012, Jung Il Woo attended the VVIP film screening of Intouchables held at CGV cinema at Sinsa-dong, Gangnam-gu. The fashion of Jung Il Woo was a bit ordinary. Jean with basic T-short, black cap, and white sports shoes, it was a casual dress which has no difference with ordinary people. Because of playing the role of Yang Myung in The Moon that Embraces the Sun, he has always been dressing in a robe. The impression which he gave after took off the robe is really different. Netizens said, “Is also handsome after taking off the robe,” “Even if the dress is ordinary, Jung Il Woo is special” and so on. The movie Intouchables is a French film, and won the Tokyo Sakura Grand Prix award in Tokyo International Film Festival. The movie depicts the tells the improbable friendship between Philippe, a wealthy man but suffered from quadriplegia physical disability, and Driss, a young offender of Senegalese descent, who is hired as his live-in carer. The movie debuts in Korea on March 22nd, 2012.